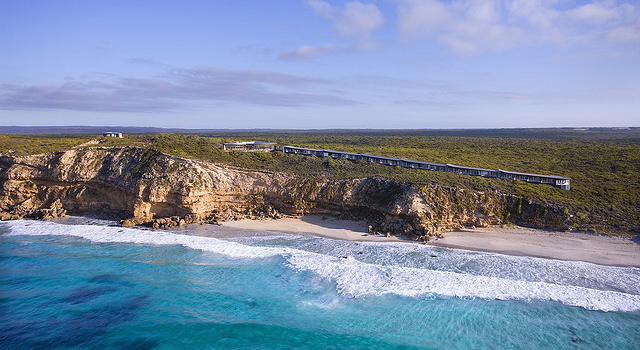 From sleeping in a swagon in the Gawler Ranges to swimming with sea lions on the Eyre Peninsula, Kangaluna Camp offers the best of South Australia with a variety of outback and coastal adventures you won’t want to miss. 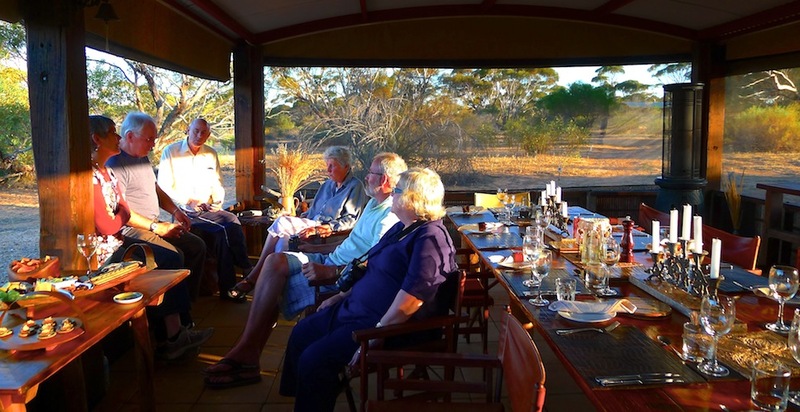 For a truly amazing and authentic outback experience there is no greater guide than Geoff Scholz, the quintessentially Australian proprietor of Kangaluna Camp in the Gawler Ranges. Born and bred in nearby Wudinna, Geoff knows the land like no other and spent 30 years combining wheat farming with opal mining at Coober Pedy before venturing into the hospitality and tourism business. Despite growing up in a small rural town with a population of just over 600, he married the girl next door and has enjoyed a lifetime of adventure with her. But after traveling the world together, Geoff and Irene had a longing for home and what they like to call their little “patch”. It was over a few cold beers at the local pub back in 1988 that they came up with the idea for the an Australian version of an African-safari style camp paired with local adventure experiences. However, it wasn’t until 2004 that the boutique campsite was completed and they saw the realization of their wildlife dream and the beginning of their greatest adventure together. 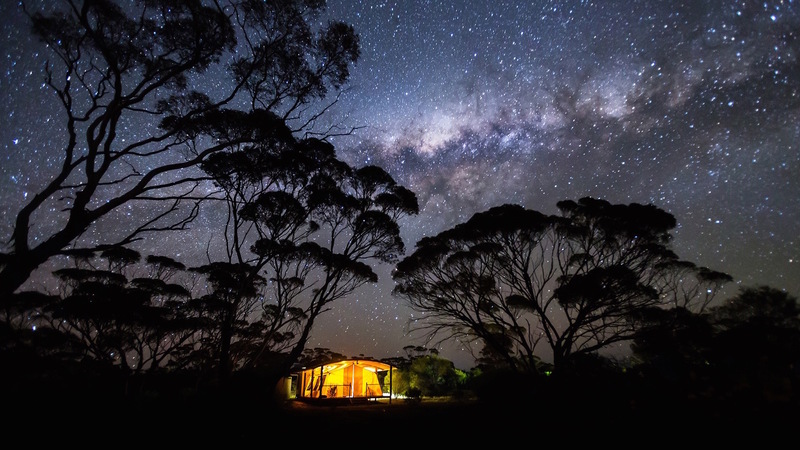 Kangaluna Camp lies 600kms to the North West of Adelaide and showcases some of Australia’s most spectacular scenery and wildlife. 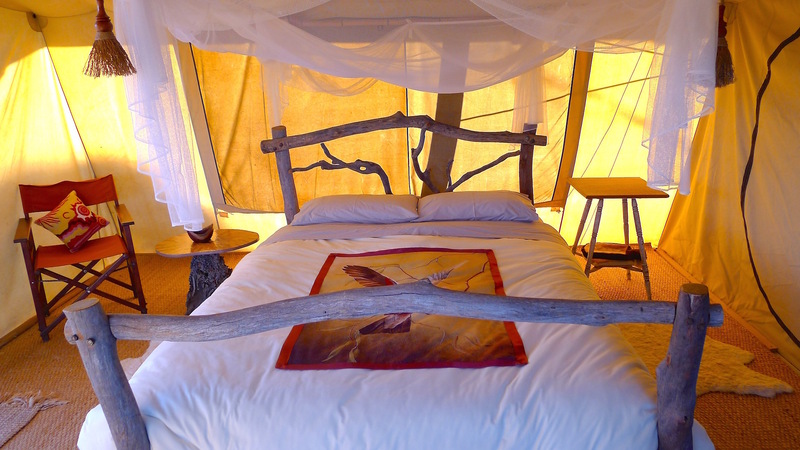 Located in the stunning mallee wilderness not far from a dry riverbed, the campsite discreetly blends into the surrounding bush so as not to disturb the balance of nature and consists of three luxury tents, which orbit around a central dining/living/kitchen area. 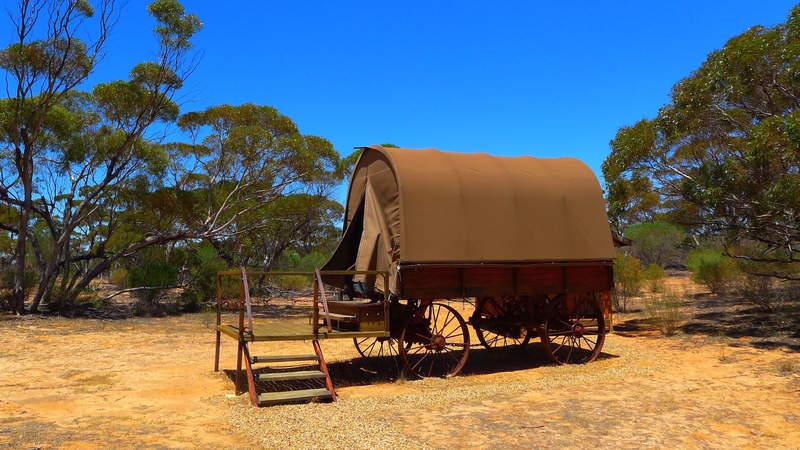 There is also the popular ‘swagon’ (aka the ‘galaxy suite’) where the sides roll up giving guests the chance to sleep al fresco under the southern stars. All the tents are eco-friendly with curved tin roofs to keep them cool in the day and contain a queen bed and two singles with ensuite. Stylishly decorated with handmade wooden furniture, the tents have a warm and cosy rustic feel. A well-known local artist designed all the bedding covered in beautiful silkscreen prints of the local flora and fauna. And Geoff and Irene’s personal touches can be found all over the camp making it feel more like a home than a campsite. The diverse terrain surrounding the camp changes from semi-desert to arid to eucalypt woodland with age-old volcanic gorges and weathered rocky outcrops that tell a multitude of stories. In the spring, the desert comes alive with a carpet of wildflowers that covers the landscape and attracts over one hundred species of colorful and diverse birdlife including rare pink Major Mitchell’s cockatoos. There are also many large kangaroo, emu and wombat populations making this the Ngoro Ngoro Crater of Australia. Geoff is a fountain of knowledge and knows every nook and cranny of this beautiful region, including ancient stories and rituals that have been shared with him by the local Aborigine community with whom he has a close relationship. 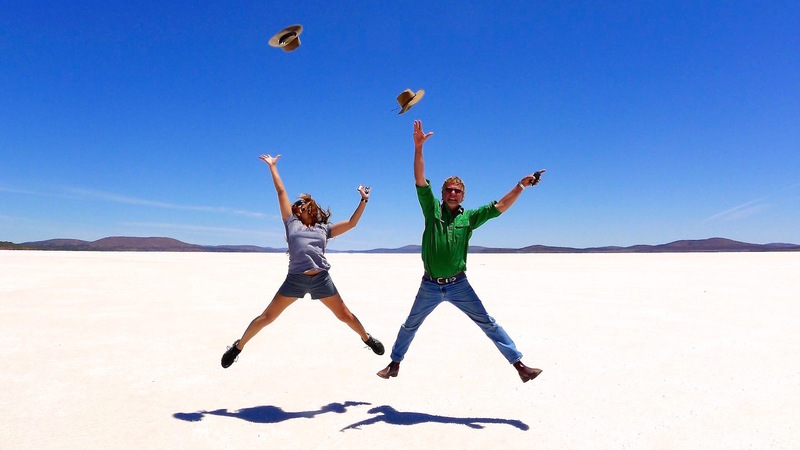 It’s rare to find anyone these days so deeply connected to the history, land and indigenous culture, so it’s not surprising he works as a specialist guide for the Tourism Australia and the South Australian Tourism Commission. An active Board Member of Tourism Eyre Peninsula since 1995, Geoff also sits on the Board of the Regional Development Tourism Target Team Eyre Peninsula. This is a man who cares deeply about the land and works hard to preserve it with the support of the local community. His great insight and passion for his patch is what makes a visit to the Gawler Ranges much more than just a photo op – it’s the trip of a lifetime. Our three-hour drive to Kangaluna Camp from Port Lincoln was a long, hot and very straight one interrupted only for a quick look at one of the more unusual Australian tree species: the shoe tree! Australians have a good sense of the ridiculous and this was the first of many amusing landmarks we came across on our journey. As the roads turned from chalky asphalt to red dust, the ochre landscape intensified with the setting sun making for a dramatic arrival at the campsite as all the kangaroos, wallabies, emus, and goannas gathered at the local watering hole for a cool drink at dusk. After a warm welcome from our hosts, we joined them over some cold beers and chilled white wine. 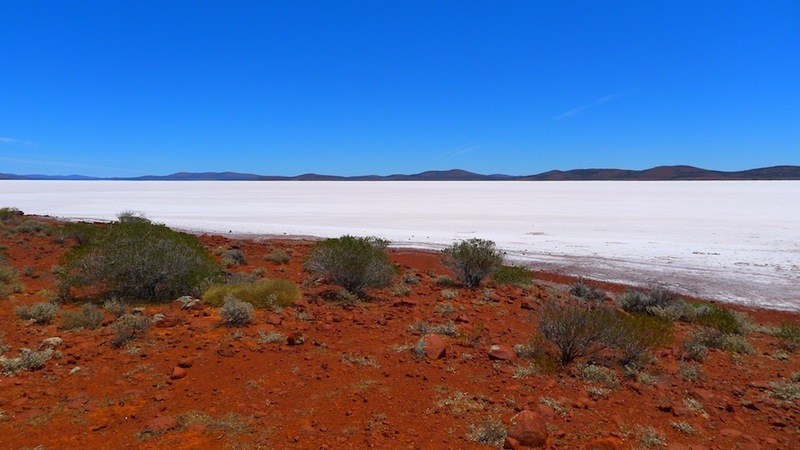 After awakening to a chorus of raucous cockatoos keen to get on with the day, we were too and so set off after breakfast on our first adventure to see Lake Gairdner – an enormous endorheic salt lake over 160 km long and 48 km across. It is the fourth largest salt lake in Australia when flooded and a photographer’s dream. Every season and every hour reveals a different picture. Australian photo-artist Frederick Murray made a wonderful documentary film called SALT about Lake Eyre, also in South Australia, which charts the personal journey of the artist, the creative process and the landscape itself giving viewers a beautiful window onto this special part of the world. On our return, we passed through remote and rocky roads to the Yandinga Valley to stop and see the magnificent Kolay Mirica Rocks or ‘Organ Pipes’ – a natural volcanic rock formation more than 1600 million years old. A geologists dream! Shaped like an amphitheatre this is a sacred place for Aborigines and nature lovers alike. Sadly, not a great deal is known about the Wirangu and Parnkalla people who originally occupied this region as they were largely displaced by the European pastoralists who moved in during the mid-nineteenth century to begin their own battles and love affair with the land. Our day finished with sunset drinks at Sturt’s Lake as we walked across the crusty flats through vibrant orange, red and pink natural quartz quarries that glowed in the sunset. The vast emptiness, raw beauty and complete stillness stunned us into a respectful silence. Back at the camp, we sat around the campfire to swap stories from the day and watch the night sky unfold in all its glory. Geoff pulled out his 8-inch computer controlled telescope so we could get a better look at Saturn, Jupiter and the full moon. Later, as I snuggled under my duvet in the swagon looking up at the canopy of stars, it struck me how ironic it was that such a natural experience had become such a rare luxury in this day age, and how lucky I was to have the whole universe all to myself…just for a moment. On our second day we got to visit with friends of Irene and Geoff’s on their nearby homestead, which looked more like a film set strewn with all kinds of historical farming paraphernalia. Word had got round that they had adopted a lost or abandoned Joey, only a few months old. The excitement was palpable as we got the rare chance to nurse and feed the baby kangaroo. Geoff had to drag us clucky girls away and then as if things couldn’t get any better, we ran into a mob of enormous western grey kangaroos and even spotted two of them hugging each other. 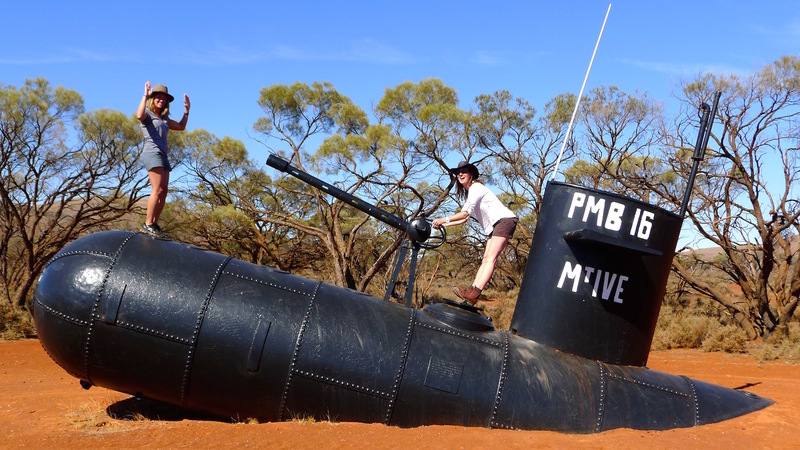 More cooing and then the boys mercifully spotted another more interesting landmark – a landlocked submarine surfacing through the red earth! Well, not really… actually just an old water pipe that the locals had converted into their mailbox. It’s the Aussie way of putting the fun back into collecting the mail. 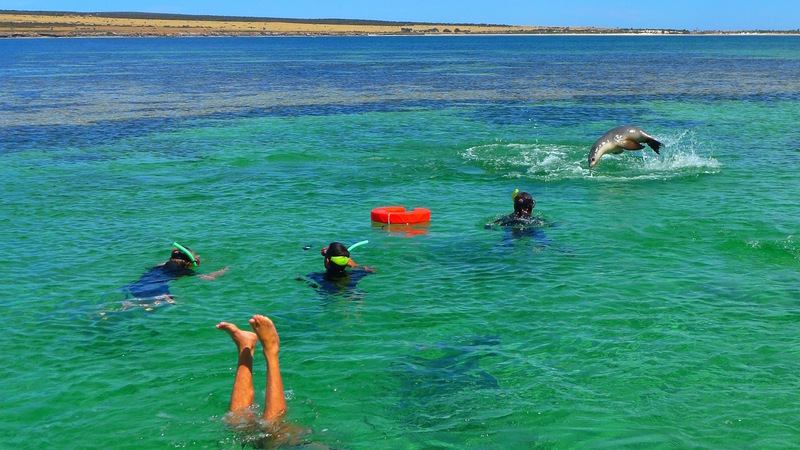 The next day it was only the lure of swimming with dolphins in the wild that could drag us away from our outback oasis. Little did we realise just how amazing this new experience would be. In a land of contrasts, the transition from desert to coast was a dramatic one and it wasn’t long before we were suited up and sitting in the back of a boat racing alongside bottlenose dolphins on the Great Australian Bight. 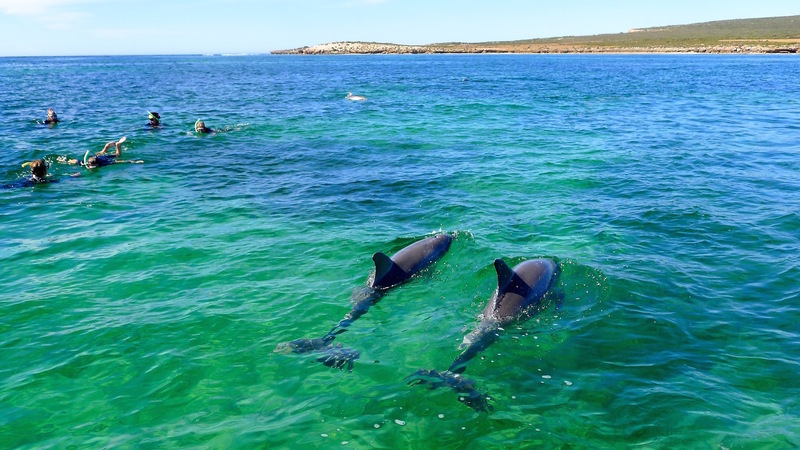 Baird Bay is a protected marine sanctuary on the Eyre Peninsula teeming with sea life, including the occasional great white shark. It’s here that Alan and Patrician Payne began their ocean eco-adventure in 1992 after being enticed into the water by a curious and playful young sea lion. 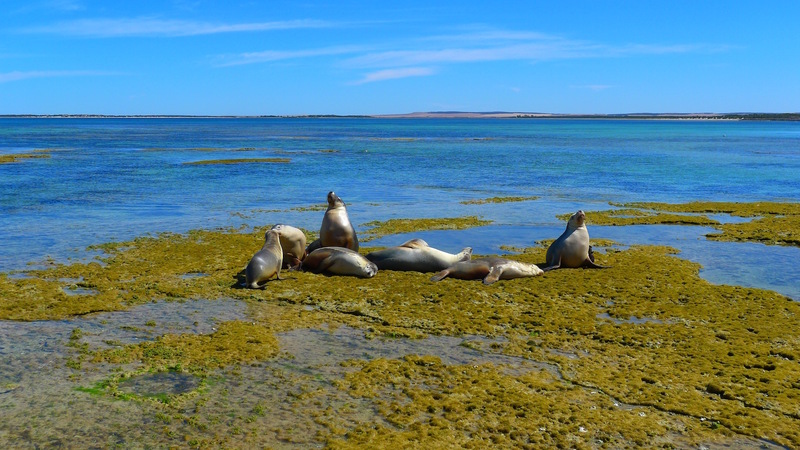 An incredible friendship began and today Alan takes adventurous visitors on a 5km journey to a protected lagoon at Jones Island near Cape Radstock where they can join these magnificent and friendly mammals in the shallow water for an incredible up-close-and-personal experience. Alan has developed a special relationship with them over many years and even given them names like Fins McCool, the Fonz, Lightning and Sunny. Our swim started in the ocean with the dolphins, but just the thought of a lurking great white was enough to put me off, despite the careful protective measures taken by our guides. Fortunately, there were braver souls than me who were happy to splash around with the large pod that had gathered beneath us, many missing bits of their fins and with large scratches and scars… I didn’t say a word! But it was the sea lions at Jones Island that got me. To hell with the sharks, one puppy-dog look from these sea cuties and I was all in. The pups are incredibly curious and love to play. They are inventive and cheeky, and very gentle despite having names like Nippa and Fang. Alan is like the sea lion whisperer; the pups adore him and clearly know him – one even kissed him! Swimming with these delightful creatures in their natural habitat is an absolute joy and privilege. We spent two hours basking in their beautiful playground with them and when we left, they were visibly disappointed and had the same long faces as my dogs when I try to leave the house. There were loud groans of “but whyyyy” and “it’s not faaaaair”. Later, as Geoff tried to bid us farewell at the airport, it was much the same. Our long sulky faces were only a reflection of the fantastic time we had shared with him in his little “patch”. Bonded by adventure and armed with enough new stories to last a lifetime, we clung to him like children not wanting our fabulous escapade to end, yet deeply grateful for the enriching life experience. Rates: Begin at AU$1800 for a twin share tent 3-day, 2-night package, including all meals, access fees and ground transport. Other packages are available and there are no age restrictions; reduced rates apply to children under 14 years. 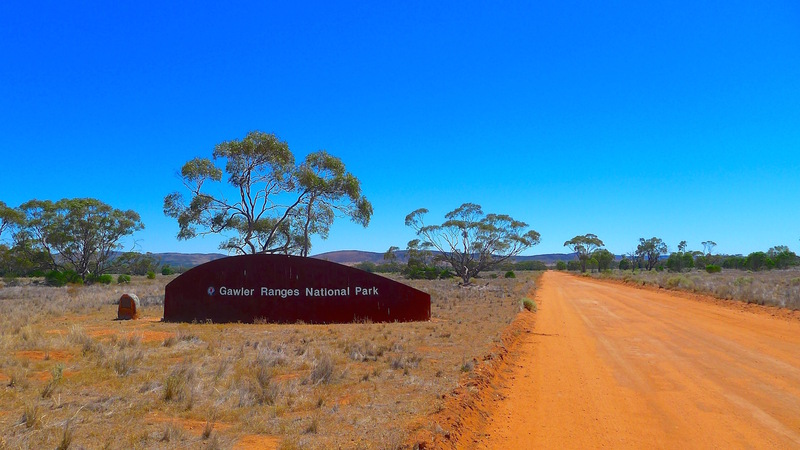 For more information visit Gawler Ranger Wilderness Safaris or email: info@gawlerrangessafaris.com / Ph: + 61 8 8680 2045. Getting There: Domestic airlines Qantas and Regional Express both fly to Port Lincoln where guests are met by GRWS. Chinta Air is available to charter to or from Wudinna from Adelaide, Kangaroo Island, Port Lincoln or Mt Ive. Kirkhope Aviation also run charter tours and private charters from Melbourne to Kangaluna Camp via Mt Ive Station and Wudinna. Hot Tip: Don’t leave town without visiting The Oyster Shed at Coffin Bay for a taste of one of nature’s true delights. These freshly shucked world class Pacific Oysters plucked straight out of the local pristine waters go down the hatch like liquid silver. 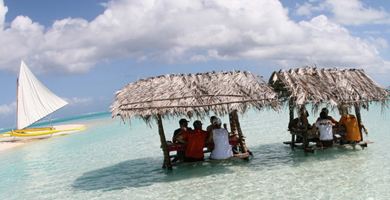 A must-do for oyster lovers! To read more about South Australia, check out our other stories on Kangaroo Island, Adelaide and the Barossa Valley. Kate was one of the first founding members of WanderMelon and is now based in Sydney where she works as a transmedia digital producer and freelance travel writer. Her stories have been published in California Home & Design, Condé Nast Traveller, Eating, New Zealand House & Garden, NZH&G On Holiday, Vogue Entertaining & Travel and Vogue.